After a brief post hiatus, I'm back with a freshly redesigned site and an uber tasty recipe. I might have ushered the changes into effect sooner, but there was lots of mind-changing, re-redesigns and header tweaking. Not to mention multiple days lost scouring the internet wastelands for a simple explanation of how to set up a variable-header/footer website. Even with my less than threadbare knowledge of html/css I had high hopes for finding a tutorial written in layman's terms. Next time I will simply ask a knowledgeable person and save myself the trouble. Anyhow, I'd like to briefly thank my boyfriend for designing the header, even though he is still not satisfied with its current state (such is the way of artists). I'd direct you to his art blog, but he hasn't updated it in ages, even though he's constantly working on new stuff. The dude is a creative machine. I most definitely envy that quality! And now that the re-design is squared away (for now) I can shift my focus back to recipes. Thankfully, my incessant need to document food on Instagram furnished me with a picture of the incredible dip I made on Valentines Day. Now I can sit and type away while sipping hibiscus tea instead of editing out yellow light from my shots in Photoshop. It's a win-win situation for occasional lazyheads like me. Yay for square cropping and filters! Well, square cropping is slightly restrictive, but what can you do. Back to the dip. See the circular container I served it in? Recognize it? It's a Whole Foods container. I'm known for my addiction to the Whole Foods olive bar. 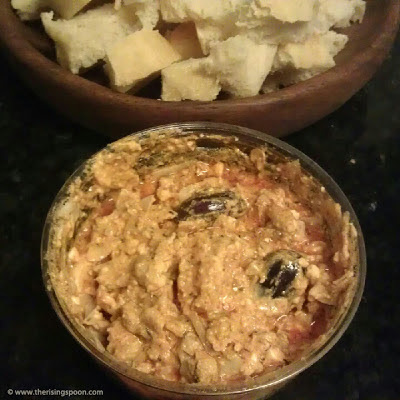 Kalamata olives, greek olives mixed with olive oil, herbs & feta, roasted red pepper pesto...the list goes on. Add to that the fact that my local Whole Foods in Dallas has TWO large olive bars in one store. When I moved here from Kansas City and saw it for the first time, I flipped out, called my sister and friend Lauryn and went into a full-on nerdgasm. To nearby shoppers, I probably looked like a big dork. I didn't care. It's kind of big deal. A creamy greek-inspired dip with goat cheese, full-fat feta, artichoke hearts, extra virgin olive oil, kalamata olives and 101 Cookbooks' Magic Sauce. Serve with a soft focaccia or ciabatta or your favorite crusty artisan bread for dipping. Follow the directions on 101 Cookbooks' site for making the magic sauce. While it's cooling (it only takes a few minutes to make), combine all the ingredients for the dip in a small bowl and lightly mix with a fork. Salt and pepper to taste, then pour in the magic sauce. If you want it more creamy and less thick, add more of the sauce. Serve with your favorite artisan bread or crackers. I used ciabatta bread, but I bet an asiago focaccia or crusty french batard would taste fantastic! You don't need fresh herbs to make the Magic Sauce. I've used dried every time because that's all I've had no hand. HOWEVER, since dried herbs are more potent (and less delicate) you'll want to halve the amount of each herb called for in the recipe. You can always add more later if you want a stronger flavor. Also, the paprika is pretty strong, so if you're not a big fan, start with a smaller amount and work your way up. Question for Discussion: What's your favorite dip for fresh bread?